We make it a point to always offer customers our best price first, avoiding the haggling process you’ll find at many other dealerships. We don’t think you should have to negotiate to get the best price on your new car — we would rather give it to you up front and avoid any hassle. In fact, we like to think that the entire experience at our dealership near Longville is fairly relaxed. Our sales team is comprised of the finest automotive experts in Minnesota, and they’re here to patiently answer all your questions while assisting you. We ensure your satisfaction by compensating our sales team based on how happy you are with your experience, rather than how much you spend at our dealership. If you’re purchasing a new car, we’ll assess the value of your trade-in with our interactive appraisal process so you get the most for your vehicle. We offer competitive rates based on the vehicle’s current market value, and will purchase your car even if you choose not to buy one from us. We do our best to make the entire car-buying process simple and affordable, so your work is minimized. Our sales team will provide financial solutions that meet your budget, because we want to see you drive away excited about your purchase. Best of all, we’re here for you when you need us. If you’re dissatisfied for any reason, we have a three-day/300 mile exchange policy. Plus, our dependable service center is sure to have hours convenient for your schedule. 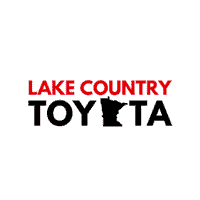 Visit Lake Country Toyota, conveniently located at 7036 Lake Forest Rd in Baxter. Trust our Toyota dealership serving Nisswa to treat you right! Whether you’re 18 or 80, you get the same price, up front, in writing, everyday. There’s no need to negotiate to get our Best Price. It’s posted on every vehicle. Our Best Prices represents great value. Relax, our sales team is here to help you make a wise choice and they’re paid based on how satisfied you are, not on how much you spend. Our customer-friendly process helps you identify what you want and need before we present a vehicle to you. This process builds your knowledge of what choices you have available in selecting your next car. You’ll know what your vehicle is worth before you start to shop. It’s based on the current market value of your vehicle and doesn’t depend on which one you want to buy. We’ll buy your vehicle even if you don’t buy ours. We have an interactive appraisal process designed for you to get the most for their trade up front without negotiating. We have the right vehicles in stock, at the best values in town. Wide variety to choose from. All value priced. We provide competitive financial services to meet your budget. Your vehicle selection and your credit history won’t change the price of the vehicle. Financial services process aimed at creating the highest value for you today and in the future. Purchase any vehicle with under 100,000 miles and under 10 model years old and you qualify for our 3 day/300 mile exchange policy! Bring it back in the same condition it was in when purchased and find a vehicle in our inventory that fits your needs better. Our professional team is here to provide you full maintenance and repair services when you want and need them. Our professional service processes are focused on customer needs. Cory wellman was great to work with. Found me the vehicle I wanted for my wife. Purchased a rav4 xle,very nice vehicle and we'll equipped.